What’s better than throwing some stuff in a crock pot and forgetting about it until dinner? Throwing 5 things into a crock pot (if you count water) and forgetting about it until dinner. Yes, you’ll need to cook some noodles, but it still doesn’t get a whole lot easier than this. I made this up one night when I began to have doubts that what I was making was going to taste good. I don’t remember what it was, I think a stove-top version of what I ended up with here. I like it when things work out like that! One would think that with so few ingredients, this casserole would be kind of, well, blah. Let me assure you, it’s not. It’s creamy and flavorful. 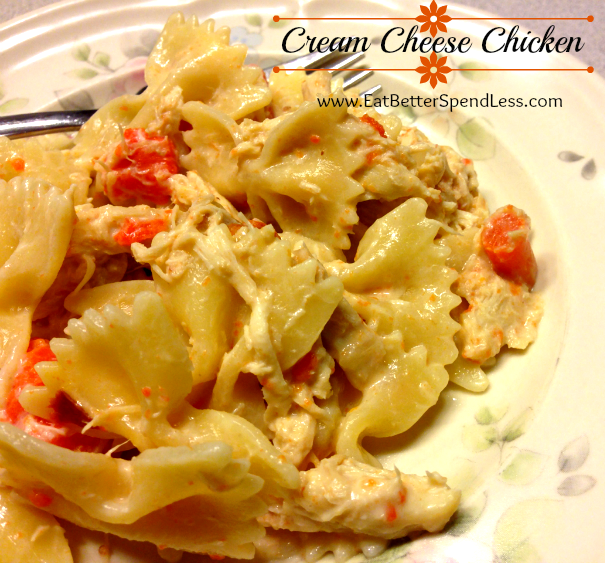 The pasta adds some wonderful texture and stretches this into a meal that serves quite a few for not much money. OK, on with the recipe. I start out with cooked chicken from my freezer but if you don’t have that you can use fresh chicken, just let it cook longer. Put the chicken, carrots, water, onion soup mix (notice, it’s not the whole package) and cream cheese into the crock pot. Don’t worry about getting the cheese all mixed in. Just cut it into chunks and let it go. You can give it a stir after a while. Gasp! did I just tell you to open your crock pot? I hope the crock pot police aren’t reading this. Please don’t tell them this but I open my crock pot all the time. And somehow it still cooks my food. And just incase you’re wondering, that’s frozen cream cheese. Yes. You can freeze cream cheese. The texture changes a little so you may not want to spread it on a cracker but for cooking it’s just fine. So when you see it on sale, pick up a few extra! OK, back to this complicated recipe. Let it cook on low for about 2 hours. Just before dinner, cook about half a box of bow tie pasta in salted water. Drain but don’t rinse, and add to the chicken mixture. You can also skip the carrots and serve with a side vegetable like green beans or salad. Spray crock with cooking spray. 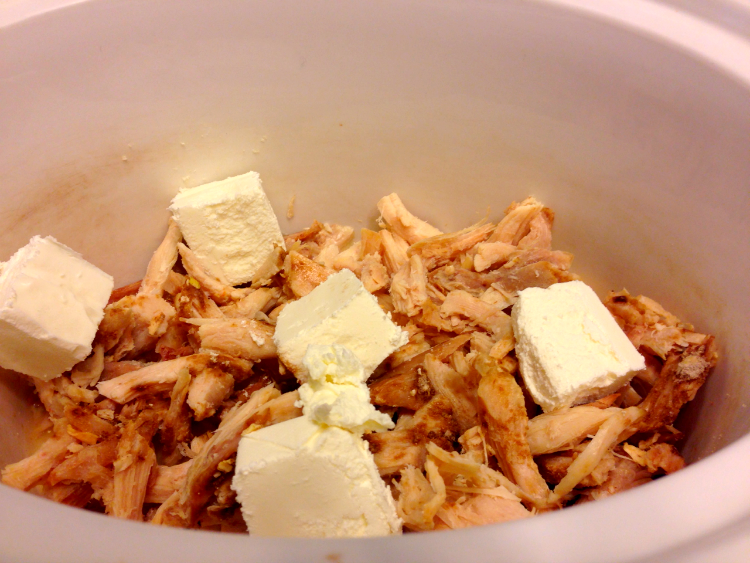 Put the chicken, carrots, water, onion soup mix, and cream cheese into the crock pot. Cover and cook on low for about 2 hours. Stir part way through to get cream cheese mixed in. Cook half a box of bow tie pasta in salted water. Add pasta to chicken mixture. *If you feel like you need a little bit more water for the carrots to cook, go ahead, but don't add too much. *This meal could be gluten free if you either used gluten-free pasta or just left out the pasta. I like tomatoes. I wonder if diced tomatoes instead of the carrots would be good? What do you think? I don’t know, I think it would really change it. I’d advise that you make it without the carrots and just serve a veggie on the side. That way you’ll know what it tastes like. Then try it with tomatoes and see which you like better. I think it would really be like 2 different meals. Bonus!